Update 1 @ 7:51 AM - Looks like it might be sold out now, I'm getting a 'product not available' message. Update 2 @ 8:18 AM - Showing availability again. Update 3 @ 12:5PM - Looks to be officially sold out now. Sunquest claims to be offering a ridiculous price on a 7 night all inclusive package (flight, hotel, food, drinks) from Regina to the Azul Beach Hotel by Karisma in the Mayan Riviera, departing on April 21 for $585/person after taxes. Travelers Choice 2012 winner, with an incredibly high proportion of reviewers rating it 5 out of 5. And that price is over 50% cheaper than the cheapest it ever usually drops to. The flight is via Westjet. Update: It looks like the price is already in effect. Click on 'Confirm Price' and you'll see it drop from $929 to $250. I imagine it won't last too long. It's hard to say how many packages they're offering at this price. On Sunquest's site, look for a vacation departing on April 21, to Mexico, and select Azul Beach, then hit Search to find it. 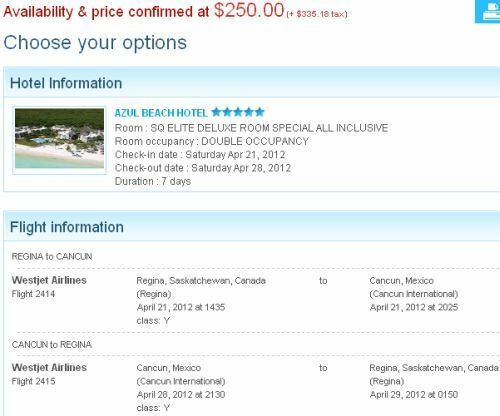 regina, yqr, mexico, all inclusive deals, mayan riviera and sunquest vacations.